How I highlighted four characteristics of the medium. 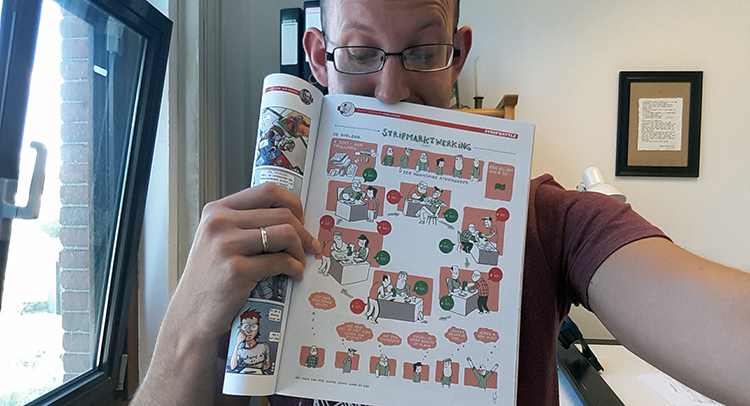 StripGlossy is a Dutch magazine (a glossy, actually) completely devoted to … comics! One of the categories is the so-called ‘strip-battle’ (strip is the Dutch word for comic) in which three young (uhum) comic book artists compete against each other. Last year, I was asked to join this comic battle. In each of the three preliminaries, we could make a comic of one page. The two comic book artists who had the most votes at the end of the preliminaries, could proceed to the finals. Each round followed a specific theme to which you could link your comic. Initially, I was doubting if I would even participate in this comic battle. Public votes? Is this really an honest way to decide which comic is the best? Won’t such a comic take up too much time in my already busy schedule? And experience has taught me that, when you only have one page to work with, it is extremely difficult to do something else besides a ‘simple’ gag-comic. While it’s obviously my comcisperimenter-goal to show and explore the different possibilities of the medium. Is that even possible in such a small space? BUT, comics are obviously a medium that flourishes thanks to (and not despite of) limitations (deadlines, page size etc.). Oh and it is quite cool to be printed. So, I decided to join! I wanted to highlight one of the unique aspects of the medium in every round (so each comic). And also stick to the theme of that specific round. These aspects are: the verbal-visual blend, what are comics anyway?, drawing style and participation. In this article, I’d like to show how I covered these aspects in every comic. One of the main things which differentiates comics from other art forms, is the interplay between words and images. A comic is more than just images. But definitely more than just text. A successful comic makes use of both word and image to create a whole which is greater than the sum of the parts. This view was the angle from which I approached my contribution to StripGlossy 04, themed ‘job application’. The text is an (formal) acceptance letter, while the images show the trick the candidate has played to get this. The effect would have been considerably smaller if I had literally depicted the conversation, or if I had let the main character read the letter. Active participation is now requested from the reader, causing him/her to get more involved in the story. 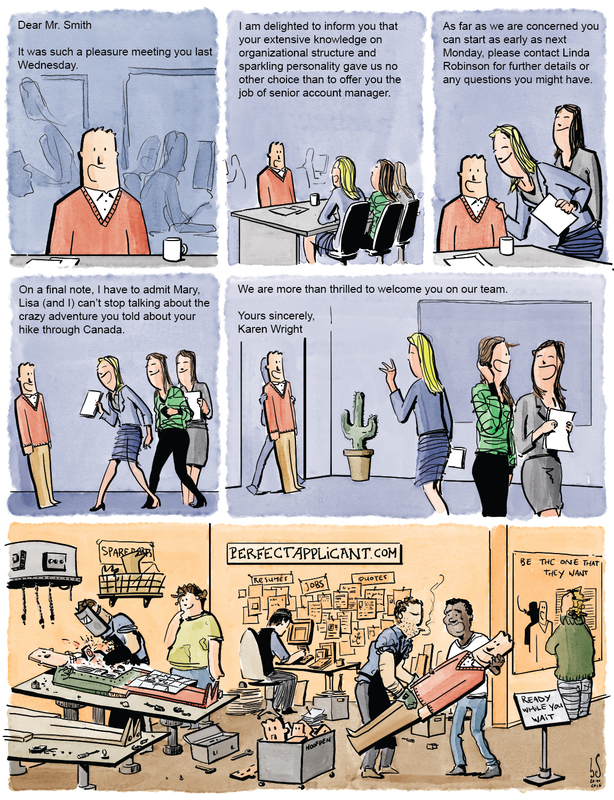 Read more about The Job Interview and the underlying ideas here. 2 What is a comic anyway? It remains a challenge to come up with a good definition of ‘a comic’. • mainly that one obscure graphic novel exploring teenage insecurities. Fortunately, there are people who have been creating and studying comics for years. Well, that’s quite a mouthful! Harvey and McCloud partly agree: they both talk about ‘sequence’. But it is remarkable that McCloud refers to the purpose of the comic (conveying information, or arouse). On top of this, Harvey explicitly includes ‘text’ in his definition, while McCloud (intentionally) leaves this out. Damn Will, that’s quite a challenge! Not only does Eisner include text (just like Harvey), but he’s also considerately more outspoken than McCloud when it comes to the function of a comic! While McCloud thought it sufficient to ‘convey information’, Will won’t let you get away with this! As a comic book artist you need to be quite ambitious and you should not only grasp the attention of those damned sophisticated and critical readers, you should also challenge them to pieces. 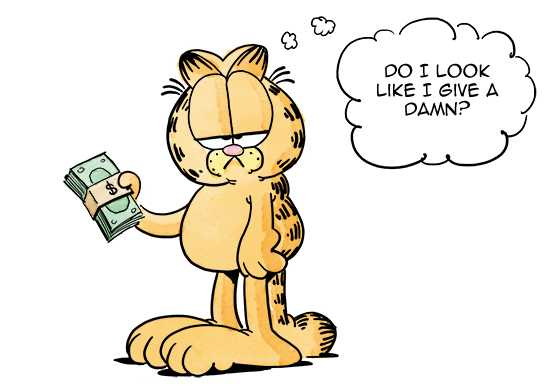 Based on Eisner’s definition, once could actually state that Garfield is not a comic at all! These definitions directly challenged me to find out what the boundaries of comics exactly are. 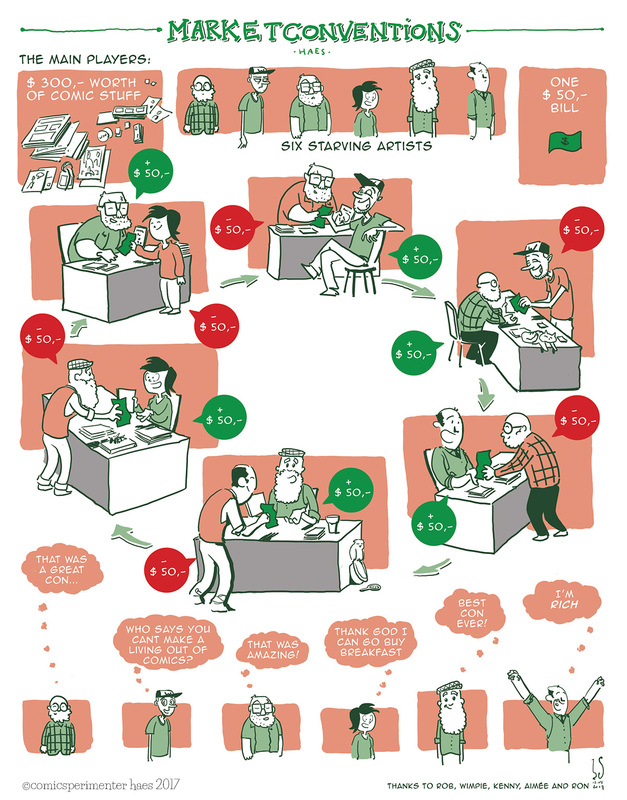 This shows us a type of infographic, illustrating the cycle of a comic fair. Traditional boxes and speech balloons have been left out. But it does in fact have ‘juxtaposed images’ and they are indeed ‘intended to convey information’. And perhaps they might even ‘produce’ an ‘aesthetic response in the viewer’. Read more on Comic market conventions and the various Dutch comic writers who make a cameo appearance here. Even though comics are a blended medium (see 1), many readers still focus on the quality of the art. Not very surprising, considering it’s what catches your eyes first. But one should keep in mind that perfect drawings do not guarantee marvelous comics. Especially in the ‘adventure genre’, drawing semi-realistic (female) figures seems to be more important than wondering if they really add something to the narrative. In my opinion, the focus all too often lies on the art, at the expense of the narrative. However, true masters of the medium use drawing style to enhance the narrative. 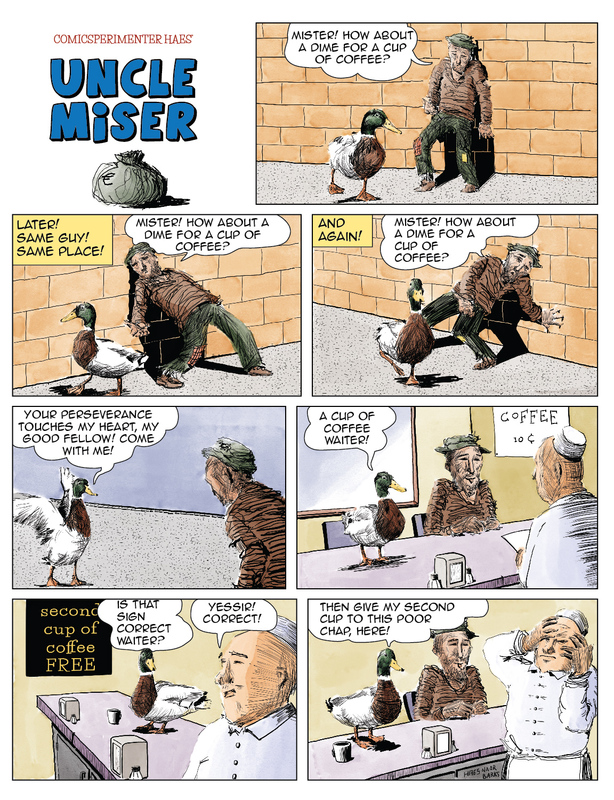 To prove that a semi-realistic drawing style does not necessarily make a good comic, I decided to re-draw a classical Scrooge McDuck comic for StripGlossy 06. What is this? A talking duck? Drinking coffee? In short, the joke’s become less funny. This is a bad comic, even though the style of drawing may be cool and semi-realistic. Read more about my version of ‘Coffee for two’ here. One of the main differences between now and – let’s say – twenty years ago, is the way in which writers and illustrators can have a direct contact with their fans. This offers the unique chance to let people participate in your work, even before it is published. Although not always desirable, at the very least, it’s worth the experiment. That’s what I did for my comic ‘Heroes’ for StripGlossy 07. Therein, I drew miniature portraits of as many of my readers as possible. This comic also served as a campaign tool for the Comic Battle: getting readers to vote for me. In the preliminary of this round, I almost got 700 (!) votes. Read more about ‘hero’s’ right here. So, that were, my four contributions to the StripGlossy Battle. Hopefully, I’ve clarified how I tried to highlight a specific feature of the medium in each comic. Would you like to see more of this ‘comicsperiments’? Comics that encourage you to think? Comics that differ slightly from others? Then help me win the comic battle finale! If I succeed, I’ll get the chance to fill three to four pages with my work in four editions of the StripGlossy. 2. Post a comment (for example ‘I vote for Hugo’). 3. You have voted and contributed to a diverse comic book climate!